For the past seven years, a period covering the final two years of the George W. Bush administration and Barack Obama’s entire presidency, no more than about three-in-ten Americans have said that they trust the government in Washington to do the right thing always or most of the time. A January 2013 survey finds only about a quarter (26%) saying they can trust the government always or most of the time, while nearly three-quarters (73%) say that they can trust government only some of the time, or volunteer that they can never trust the government. Majorities across all partisan and demographic groups express little or no trust in government. 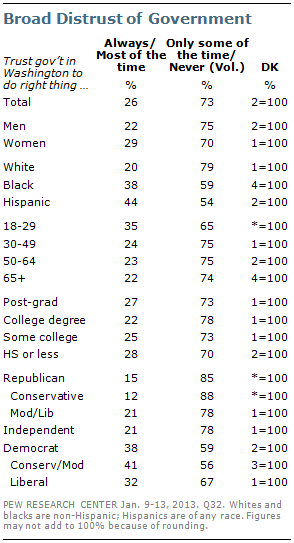 However, there continue to be sizable racial, age and partisan differences in these opinions. More than twice as many Hispanics as whites trust the federal government (44% vs. 20%); among blacks, 38% say they can trust the government always or most of the time. People younger than 30 have more trust in government than do those older than 30. And far more Democrats (38%) than independents (21%) or Republicans (15%) say they can trust the government at least most of the time.